The Pilots were also an oddity because they were the only Major League Baseball team in memory to move after just a single season (it happened only one other time in the twentieth century--ironically, to the original Milwaukee Brewers, who became the St. Louis Browns after the 1901 season). The Pilots were also the first Major League Baseball team to declare bankruptcy wore the wildest-looking uniforms ever seen up to that time. 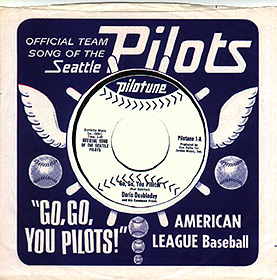 The Pilots' 45 rpm single with picture sleeve.